Photo: Villarreal B goalscorer Enric Franquesa takes control of the game. Villarreal B’s hard work and good football was barely rewarded. Miguel Álvarez’s side came away with a hard-fought draw against combative and tempestuous opponents. They let the three points slip away from them only because of a lack of killer instinct in the box in the second half, a half where they dominated with an extra man. Villarreal B surprised CD Castellón in the first moments of the clash. The home team pushed high up the pitch early on, leaving spaces at the back which Álvarez’s side were able to make the most of. In the third minute, Samu went close from an effort within the box, when his shot was deflected after a great individual effort. It was a taste of what was to come. 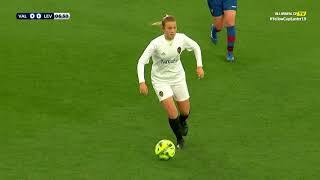 Just a minute later, Samu found himself with the ball once more in the middle of the pitch, before an excellent bit of movement and fantastic pass saw him play in Enric Franquesa, who, was able to just get touch on it to see the ball end up in the opposition’s net. The Yellows were in front with the match only having just started. After the goal, the home team pushed forward and forced Villarreal B deeper, but the Yellows were able to contain Castellón’s best attacking efforts. Despite that, five minutes before half-time, Hicham was able to lash the ball towards the goal from inside the box, with the ball going under Joan Femenías for Castellón’s equaliser. After the half-time break, the Yellows pushed forward and took control of the game. Villarreal B were the side with more dominance on the ball and they put together large spells of possession in the opposing half. In the 52nd minute, a lightning-quick Villarreal B attacking transition ended with a one-on-one for Simón Moreno, who was taken out by Castellón’s Eneko as he went to shoot. The referee took out his red card and Castellón were left with ten men. With a man up, the Yellows tried a number of ways to score a goal to get themselves in front. Rubén Mesa and Samu had the best chances for Villarreal B, who pushed their opponents back, but were unable to find the crucial winner. 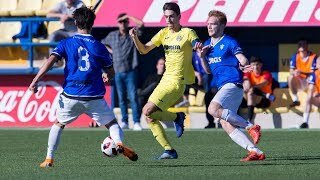 Despite not being able to find a goal in the closing stages of the match, Villarreal B earned a hard-fought point away from home, which gets them off the mark in the league, after opening the season with two losses. 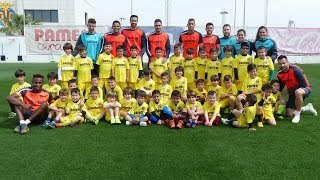 The Mini Submarine’s next match will be this coming weekend against CD Alcoyano in the Mini Estadi at Villarreal's training ground, the Ciudad Deportiva. 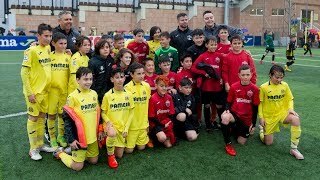 CD Castellón: Campos; Rubén, Regalón, Delgado, Eneko; Gálvez, Caballero, José Carlos, Verdú (Luismi, m. 60), Hicham (Muguruza, m. 84); Mayor (Cubillas, m. 12). Villarreal B: Joan Femenías; Andrei, Roger, Carlos, Quintillá; Samu, Ramón, Beitia (Akale, m. 77), Enric (Iván, m. 77); Simón (Villa, m. 72), Rubén Mesa. Goals: 0-1. Min. 4: Enric. 1-1. Min. 40: Hicham. Stadium: Estadio Municipal de Castalia.